Former Hatter Cameron McGeehan faces a crucial season ahead according to Luton chief Nathan Jones. The 23-year-old, who left Luton in June 2017 signing for Barnsley when they were in the Championship, comes up against his old club for the first time tomorrow, with the game live on Sky. McGeehan joined the Tykes the back of a serious injury suffered while with Town, as he broke his leg against Portsmouth in January, in what turned out to be his final Luton appearance. It hindered his first campaign at Oakwell, as he featured just 10 times, scoring once, loaned out to Scunthorpe, playing 15 matches for the Iron. However, McGeehan is now back with Barnsley, making one start and six substitute appearances as the Tykes have made an impressive start in their aims to go back up at the first attempt and Jones thinks it’s now that he will be fully judged on his Tykes career. He said: “The injury he had, once he did his rehab then you’re just fighting to get back to where you want to be, and that sometimes takes a season, which pretty much it did. “The unfortunate thing with Cameron was, they were in the Championship, so when they were not a top side in the Championship, they couldn’t afford to integrate him here, integrate him there. “So it was a difficult season for him, as he was finding his feet, then having to step up to two new levels, which is very, very difficult to do. “I think he’ll probably be judged on this year, if he doesn’t impact or he’s a bit part player this year then that’s what he can probably be judged on. 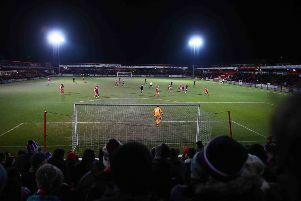 The midfielder flourished under Jones, as he netted 31 goals in 106 matches in total, reaching double figures in a campaign twice when the current Town boss had taken over. Jones confirmed he still kept in touch with McGeehan and plenty of others who have left the club, saying: "I’ve got a good relationship with a lot of players. "It’s difficult sometimes when you release a player, as after my first four or five months, there were players here I didn’t know, didn’t get time to work with, they weren’t my players and we moved them on. “It’s always difficult doing that, but with a less of a heavy heart you do that. “Then when you spend time with someone, so the next batch we let go, I had a year and half work with them and they gave me everything, and you have a bond with them, there just comes a time when you go different ways. “People like Cameron, who were really developing, he had the opportunity to go, he chose to stay here, for one window and then got injured, which changed the parameters really, so I wished him all the best. “I want the players I work with to do well, to go on to big things, hopefully with Luton, but if they go quicker or get different things, then I want them to do well. “People like Isaac (Vassell), people like Cameron I’ve kept in touch with, other people that have left us, because we still have that relationship and there’s a bond there, especially from what I ask my players to do, as I kind of demand from them, the environment demands from them and they give me everything. “So there’s a bond there a we go through highs, go through lows, but the bond is there and I like to be close to my players, I like them to know that I care about them, as I do, as it’s not a job, it’s a lifestyle and the bond develops.